Attorney Clifford Petroske founded our law firm in 1992, and since that time, we have grown to become one of the region's most respected family law practices. 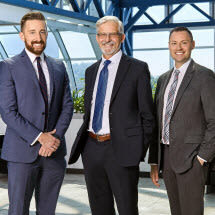 Our five full-time attorneys have almost 60 years of combined legal experience among them, providing them with the knowledge and resources they need to deliver the quality results our clients expect and deserve. Working together, our attorneys take a collaborative approach to all of our cases, helping to ensure we provide the highest level of legal service possible. If you are facing divorce or have another legal issue affecting your family, you can trust Petroske Riezenman & Meyers, P.C., for the assistance and support you need. For more information, you can contact our law firm to schedule a free initial consultation. Monday-Friday, 8:30a.m. - 6:00 p.m.